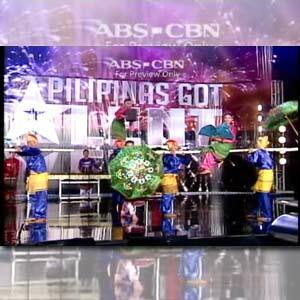 The Kaagan Dance Theater Collective from Davao Oriental performed a Muslim dance number in Pilipinas Got Talent, allowing them to pass the auditions. Fourteen Pilipinas Got Talent hopefuls made it through last week and spiced up their numbers by adding twists to their acts. They now join hundreds of contestants who have passed the auditions in ABS-CBN’s talent-reality search. Benjamin Petilos Jr. (fondly called Bam) brought Jon Bon Jovi and Pilita Corrales on stage as he imitated their voices while singing his rendition of hit rock song "It’s My Life." Rostela Chiong, 16, on the other hand, from Cebu wowed the judges with her vocal prowess, singing Whitney Houston’s "I Will Always Love You," and at the same time heated up the crowd with her belly dancing skills, gyrating gracefully ala-Shakira. Pop chorale group Koro Colegio De Dagupan also proved to be unique and took the risk of singing the classic love song "Unchained Melody" on quite a different beat. Other remarkable talents who got the coveted "yes" from the big three judges include Ingrid Payaket of Baguio City who turned the stage into a Broadway show after she flawlessly sang a song from hit musical Miss Saigon, Kaagan Dance Theater Collective from Davao Oriental who took the crowd on a cultural trip with their Muslim dance number; and Maria Jeline Oliva of Naga City who amazed everyone with how well she played a classical violin piece. Who among them will make it to the semi-finals? Keep watching ABS-CBN’s talent-reality search Pilipinas Got Talent, every Saturday at 7:15 PM, and every Sunday at 8:15 PM and Pilipinas Got More Talent, weekdays, 4:15 PM.